Oh no. What sort of trouble? Ed Miliband has accused David Cameron of "unjustified smears" over claims about Labour's links to disgraced ex-Co-op Bank chairman Paul Flowers. (slightly irritated and with exaggeratedly clear accent) Ed Miliband has accused David Cameron of "unjustified smears" over claims about Labour's links to disgraced ex-Co-op Bank chairman Paul Flowers. I don't know. 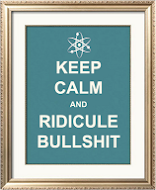 I’ve been told to display the news that Mr. Miliband has accused David Cameron of “smears” over Co-op. - I didn't expect the Monty Python reunion. Jarring chord. The link is clicked and the web page displays the news that Monty Python are to reunite for a one-off show in London. I didn't expect a kind of Monty Python reunion. The link is clicked again. Jarring chord. 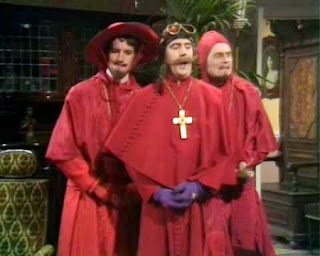 Nobody expects the Monty Python reunion! Amongst our weaponry are such diverse elements as surrealism, satire, collage stop motion animations and an almost fanatical devotion to a dead parrot, and silly walks - oh damn! (to Gilliam) I can't say it; you'll have to say it. Palin bundles the Pythons outside. Stop. Stop there! Stop there. Whew! Our chief weapon is satire, blah, blah, blah, blah. Terry, read the leak.